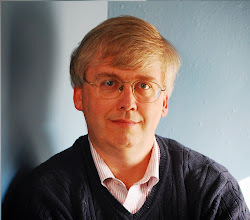 CONVERSABLE ECONOMIST: A Shorter Work Week? "In February 2018, following three 24- hour strikes at companies including Daimler, Siemens, and Airbus, Europe’s largest industrial labor union, IG Metall, in an agreement with employers, secured for each German metal worker the right to work less than the standard weekly hours of 35 and as few as 28 hours a week, if a worker so chooses. Those who work fewer hours will be paid only for hours worked, so they will see their weekly earnings fall below those who work longer. "This arrangement comes into effect in January 2019 and will be revisited and perhaps revised in two years when the agreement comes to an end. Some newspaper reports claim that the union turned down a 6.8 percent pay increase to achieve its goal of obtaining for workers a wider choice in their working hours. For their part, employers won the right to offer more workers longer 40-hour contracts. Workers are not required to accept longer hours. In short, both employers and employees have secured greater flexibility in their choice of working hours. This change in work schedules in Germany has been preceded by experiments with shorter hours in Sweden and with calls from workers in Britain for a standard four-day working week. "German workers already work substantially fewer hours than the typical American worker. Their standard workweek is 35 hours and their vacations are weeks longer than those of American workers. By law, full-time German employees are currently entitled to a minimum of four weeks of paid vacation in addition to a number of public holidays, the precise number varying from one state to another; there is no such legal right for American employees. Consequently, one estimate from the Organisation for Economic Co-operation and Development (OECD) is that the average annual hours of work of the typical German worker are about 400 hours fewer than those of the American worker — or about 10 weeks shorter based on a 40-hour workweek." What do German employers get out of this deal? They get flexibility, in the sense that if some workers want to work longer hours, the firm can hire them to do so. 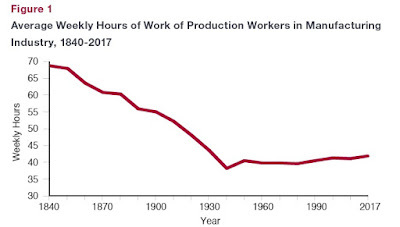 Furthermore, Pencavel argues that for many workers, labor exhibits diminishing marginal productivity over the work-week: that is, the 25th hour worked in a week is on average more productive than the 35th or the 45th hour worked. Thus, employers will be getting the more productive hours from workers, for the same hourly pay. 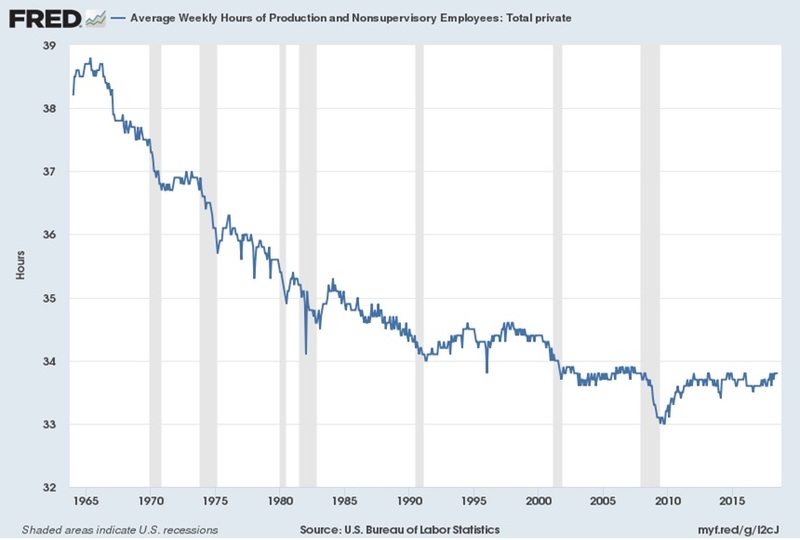 Here's a different figure, not from Pencavel's brief, showing average weekly hours for production and nonsupervisory workers in all industries, not just manufacturing. This average includes part-timers. This shows an ongoing drop over time, although it may have levelled out around the year 2000. Specifically: "Average weekly hours relate to the average hours per worker for which pay was received and is different from standard or scheduled hours. Factors such as unpaid absenteeism, labor turnover, part-time work, and stoppages cause average weekly hours to be lower than scheduled hours of work for an establishment. ... Average weekly hours are the total weekly hours divided by the employees paid for those hours." "One study reports that the fraction of [US] men who usually work 50 or more weekly hours increased between 1979 and 2006 — the increase greatest for college graduates and salaried workers: The fraction of men in the top hourly earnings quintile who usually work 50 or more hours increased from 15 percent in 1979 to 27 percent in 2006. 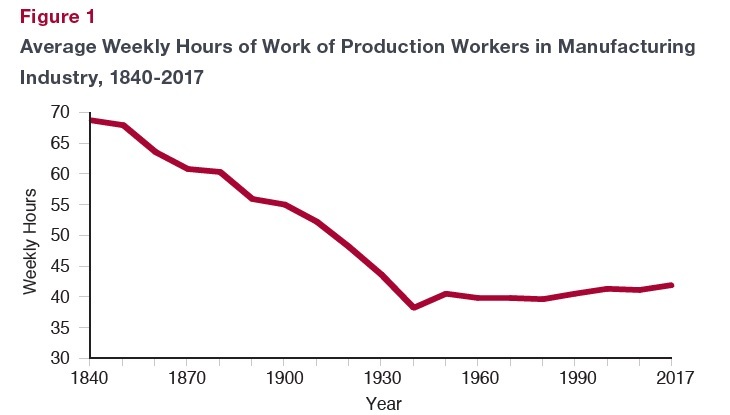 Whereas a century ago, the lowest-paid workers worked the longest hours, today the longest hours are worked by the top 10 percentile of earners. This conforms to the perception that, in some sectors, a culture of long working hours has emerged where an individual’s long hours are a rite of passage into the upper echelons of a company’s hierarchy. 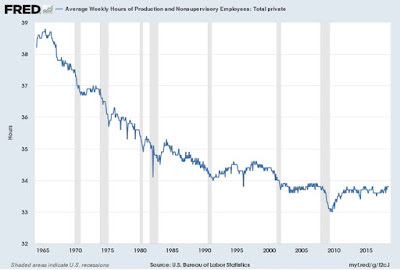 Insofar as it is those at the top of the earnings distribution who set society’s agenda, will we hear more agitation for a shorter workweek and more flexible work schedules over the next decade?"